County officials seek to proceed with construction of the Soapstone Connector, a major road extension between Sunrise Valley Drive and Sunset Hills Road, amid concerns the path of the half-mile extension would disturb potentially historically significant buildings on Association Drive. 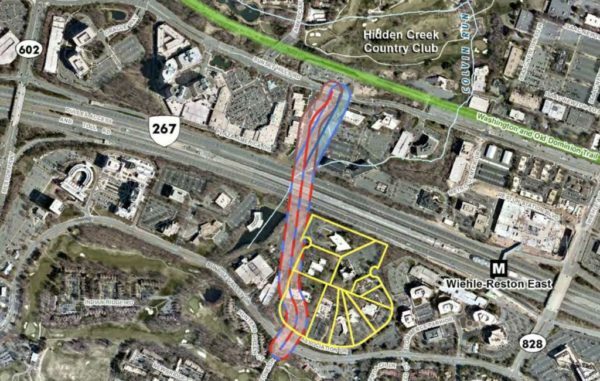 On Sept. 25, the Fairfax County Board of Supervisors voted to support the county’s proposed route for $169 million project because buildings on Association Drive are not likely eligible a historical designation on the national register. The board’s approval responds formally to a Virginia Department of Historic Resources letter that urged the county work with the Fairfax County Architectural Review Board (ARB) to determine if the buildings on Association are historically significant. Earlier this year, the ARB raised concerns that the 1916 Association Drive and ten office buildings on Association Drive could be eligible for National Register of Historic Places as a historic district. The county’s environmental assessment of the property did not concur with the ARB’s analysis. Construction of the connector, which will create a new crossing over the Dulles Corridor, is not anticipated to begin until after 2023. Tom Biesiadny, director of the county’s transportation department, said the county was ready to pitch its proposed route in January when concerns about the historical significance of the buildings arose. After direction from state officials, the department consulted with boards, agencies, property owners and developers to determine how to proceed. Two historic studies commissioned by architectural historians offered conflicting opinions on the historical significance of the buildings, which served educational associations. If the state’s historic resources department determines the proposed route of the Soapstone Connector impacts historic resources on the site, county officials will need to mull additional alternates to avoid disturbing any historic resources. But county officials hinted the overall discussion on the impact of possibly historically significant buildings was largely moot because the entire office park is slated for potential redevelopment as a mixed-use project. Reston’s comprehensive plan was amended in 2014 to allow high-density development in the area and property owners have long expressed eagerness to proceed with redevelopment. “I think you’re looking at an uphill climb to preserve this area as a district,” said Frank Selden, director of the Fairfax County’s Department of Planning and Zoning. Biesiadny also said the future road connection would run through the building on 1904 Association Drive, which is not likely of historical significance. The building that is likely historically significant is 1916 Association Drive and lies on the opposite side of where the connector would run through. The board indicated overall support of the project, which it formally approved several years ago. Hunter Mill District Supervisor Cathy Hudgins said the connector was desperately needed to manage traffic generated by additional redevelopment and development. “This would be an additional north-south crossing of which we have two that are already congested and [are] desperately in need of an alternative,” Hudgins said. She also suggested the county and the developer could acknowledge the historical significance of the buildings through other means. An attempt to defer the vote to the board’s next meeting failed. “This is not something that hasn’t been vetted and worked through,” said Fairfax County Board of Supervisors Chairwoman Sharon Bulova. Although the state transportation department is procuring a consultant to design the Soapstone Connector, design work cannot begin unless state officials are aware of the final road alignment.